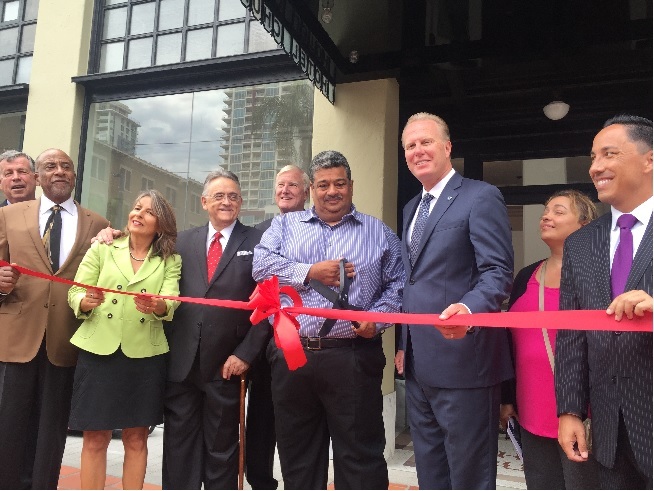 San Diego – (RealEstateRama) — With the goal of providing housing for homeless veterans and creating opportunities for San Diegans to succeed, Mayor Kevin L. Faulconer was joined today by a host of local dignitaries for the grand reopening of the 102-year-old Hotel Churchill, which has been renovated into 72 special-purpose units for veterans and at-risk youth. Hotel Churchill is housing 56 homeless veterans as part of Mayor Faulconer’s “Housing Our Heroes” campaign – a call to action to house 1,000 homeless veterans. So far, the campaign has successfully housed more than 320 veterans and counting since it began in March. The renovation of historic Hotel Churchill created affordable rental studios with a kitchen and bathroom in each unit for homeless individuals. The building includes on-site social services and case management for residents in line with the Housing First model implemented by the City of San Diego and the San Diego Housing Commission (SDHC). The project is a key component of HOUSING FIRST – SAN DIEGO, the SDHC’s Homelessness Action Plan, which was launched in November 2014. The SDHC, working with its nonprofit affiliate, Housing Development Partners, preserved this affordable rental housing at Hotel Churchill.